Home » Uncategorized » China condemns its own export of counterfeit goods to Tanzania? 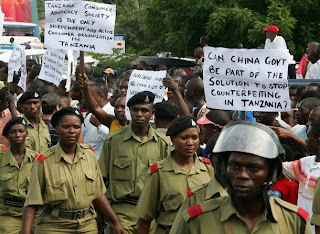 China condemns its own export of counterfeit goods to Tanzania? I came across this blog post in Afro-IP, which further references China’s Daily News. It seems as though China finds the counterfeit goods export situation regrettable and urges Tanzania to shore up their customs practices. So, China would prefer Tanzania to control the import of counterfeit goods emanating from China itself. Why not just stop exporting them? Nothing further to comment, but that is rich.